In 2003 the Coalition Provisional Authority that governed Iraq issued a new 250 dinar note decorated with an astrolabe. In late 2003 the Coalition Provisional Authority governing Iraq introduced new banknotes and coins to replace the Hussein government’s currency. 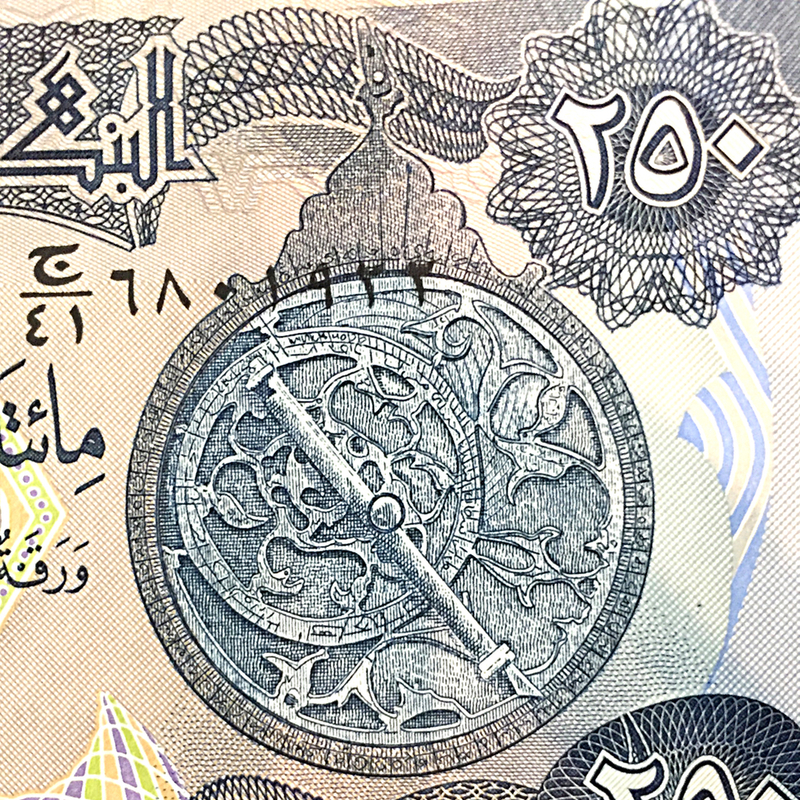 Celebrating the contributions Islamic scholars made to science, the new 250 dinar note was decorated with an engraving of an astrolabe on the obverse (and the Great Mosque of Samarra on the reverse). Detail of Iraqi 250 dinar note showing the astrolabe on the obverse. It wasn’t the first time Iraqi currency had celebrated the astrolabe. 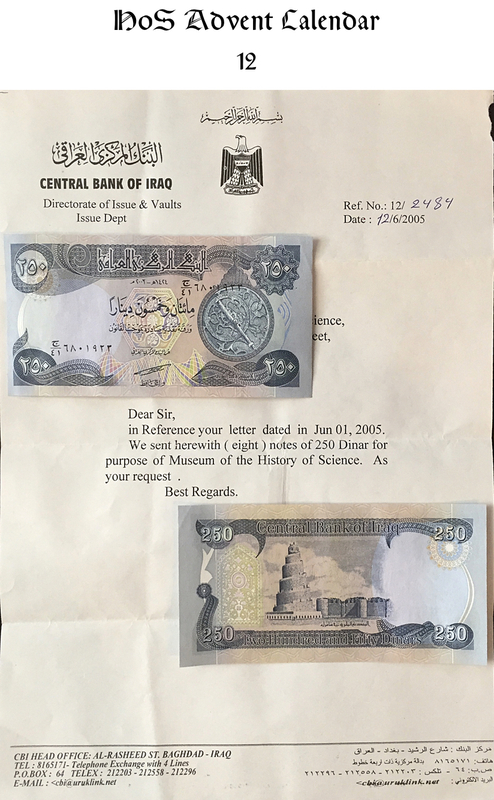 A decade earlier, in 1993 the Hussein government had issued a 1/2 dinar note with the same engravings on both sides, the astrolabe and the Great Mosque of Samarra. And then in 2002, the government issued a 10,000 dinar note with an astrolabe on the reverse. The astrolabe on this later note is a different engraving. The similarities between the astrolabe used on the 1993 and 2003 (reissued in 2013 with updated anti-counterfeiting technologies) and typical Persian astrolabes is striking. 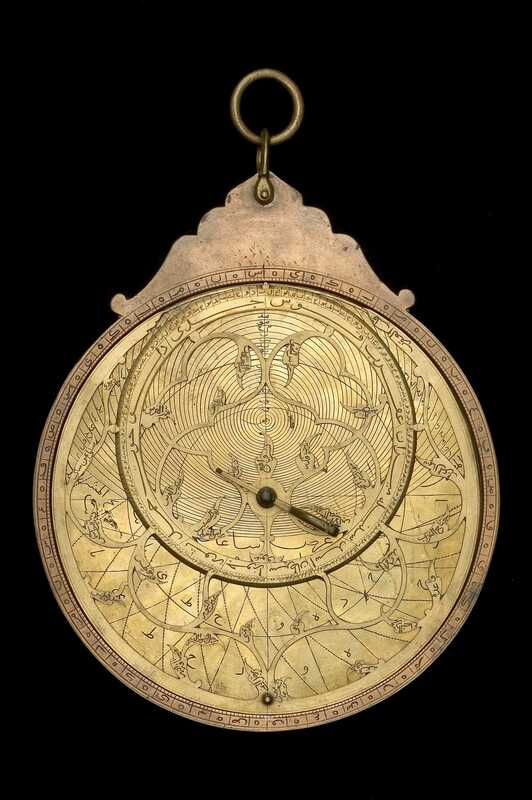 See, for example, the astrolabe by Muḥammad Amīn ibn Amīrzrā Khān, dated A.H. 996 (1587/8 CE), now at the Museum of the History of Science. 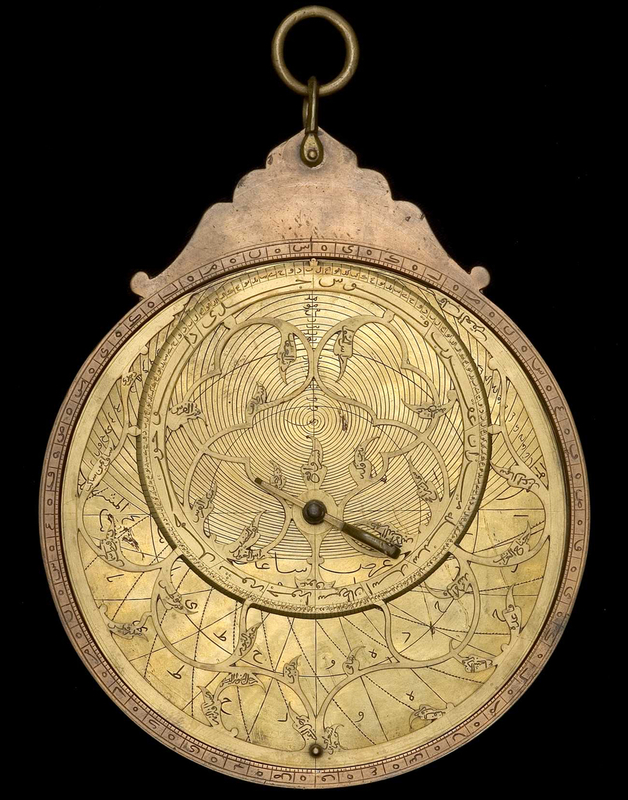 The front of the astrolabe by Muḥammad Amīn ibn Amīrzrā Khān. Note the similar throne and rete design & decoration. MHS Inv. 52399.